Story/Video posted April 23, 2018 in Arts & Entertainment by Lauren Smith. Bouncers get a bad reputation, especially ones who work at college bars. People tend to view them as someone who is trying to get them in trouble and a buzzkill. But in reality they are just doing their job and trying to keep you, other people and the bar safe. Greg Kurtz, a senior at Penn State studying agricultural sciences, also works as a bouncer at The Phryst, a popular bar located in downtown State College that is best known for being the only bar in town that serves hard liquor to you on your 21st birthday. Kurtz has been bouncing at The Phryst since Jan. 2018, so he is on the newer side of working there, but says he has seen and dealt with his fair share of people being too intoxicated and trying to get tough with the bouncers and having to kick them out. Kurtz has worked as a bartender or waiter since high school at multiple restaurants in the Centre County area. He didn’t apply to become a bouncer at The Phryst, his friend offered him the job and he took it because he needed some extra pay. Kurtz says he now recognizes that bouncers are not people just trying to ruin your night, they are just doing their job. Kurtz says that graduating in May of 2018 will end his bouncing career. He is applying to become an officer in the Pennsylvania State Police. 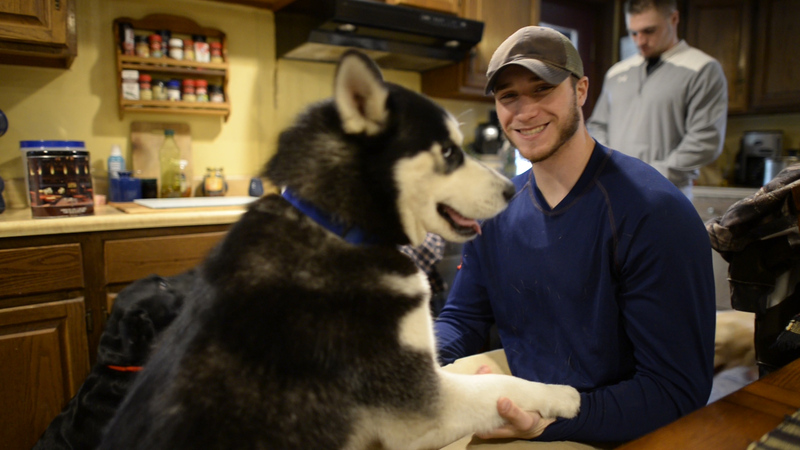 When Kurtz is not bouncing at The Phryst he likes to go home and hang out with friends, fish, and take care of his two puppies, Kip, a one-year-old yellow lab, and Oakley, a one-year-old husky.